This new image, taken by photographer Jeff Stamer, spotlights the observation tower at Clingmans Dome, in the Great Smoky Mountains National Park. The futuristic feature evokes something out of "The Jetsons." He called this photograph "Tower of Terror." 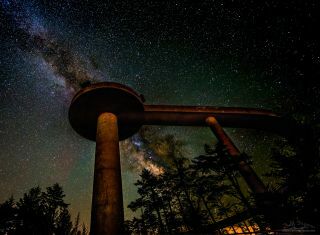 The Milky Way forms a spectacular streak past the curving edge of an observation tower in the Great Smoky Mountains National Park in these amazing views by a talented astrophotographer, who likened the vista to the Jetsons' cartoon futurescape. Photographer Jeff Stamer snapped this futuristic feature earlier this year, in late April, when he ventured out at around 4 a.m. to the Clingmans Dome observation tower in the Great Smoky Mountains National Park. Jeff Stamer grabbed multiple views of the Clingmans Dome observation tower in the Great Smoky Mountains National Park, and even tried to create a time-lapse video (it was less than 1 second long). He called this image "♫Meet George Jetson...♫". In fact, Stamer felt the "Jetsons" vibe so strongly, he says, he even titled one of his views "♫Meet George Jetson...♫" — music notes and all. The other, he called "Tower of Terror." Clingmans, located in Tennessee, is the third highest mountain east of the Mississippi River, so the night hike up there was quite chilly, Stamer said. Once there, he illuminated the observation tower with a headlamp for a few seconds during 30-second exposures with his Nikon 14-24mm f2.8/ ED. "It took quite a bit of trial and error to avoid having one section overexposed and the other dark, but eventually I got the hang of it," he wrote in an image description on his website. The Smokies are a spectacular place to grab shots of the Milky Way, and Stamer offers tips on his website for this spot: The Milky Way isn't visible early in the evening during spring, hence the 4 a.m. trek, but by late fall you can see it right after sunset. The galaxy also starts off in the southeast, in spring, but shifts to the southwest by fall. He uses the SkySafari phone app to find exactly when the Milky Way will rise. Jeff Stamer snapped this photo on the way to the observation tower at Clingmans Dome, in the Great Smoky Mountains National Park. Stamer also recommends that photographers dress warmly, and be ready for the wet environment. "I swear that I get wet at least half the time I'm on Clingmans, even if the rest of the park is dry," he wrote. "Pack your rain gear for you and your equipment." Editor's note: The article has been updated to reflect the fact that the Great Smoky Mountains National Park straddles the border of North Carolina and Tenessee. If you have a an amazing view of the night sky that you'd like to share with Space.com for a gallery or story, let us know! You can send images and comments in to managing editor Tariq Malik at: spacephotos@space.com.